Integrity Staffing Solutions – Want to Keep It Together at Work? Start Your Day Like This. Home>Blog>Want to Keep It Together at Work? Start Your Day Like This. Want to Keep It Together at Work? Start Your Day Like This. We all say this to ourselves once a while when the alarm goes off. But if you say it every day, you need an energy makeover. 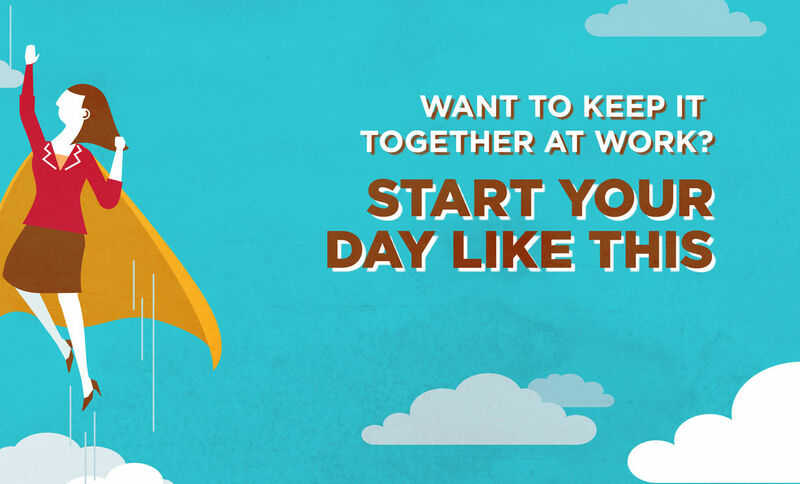 Here are some tips to help get you going and keep you sailing through the work day with ease. If you’re the type of person who’s organized and energetic enough to get up early and go for a run, you’re not reading this anyway. For the rest of us, a one-minute, all-over stretch followed by shaking out your arms and legs is a more realistic option to energize muscles and release stiffness. You don’t even have to get out of bed to do it. Remember that “I’m so tired” thinking we mentioned? It can be more of a self-fulfilling prophecy than you realize. Try starting every day with a positive thought such as, “I’m full of energy to master whatever challenges the day brings.” It doesn’t matter if you don’t believe a word you’re telling yourself. Say it anyway, and pretty soon it will start coming true. Have an Energy Boosting (not Draining) Breakfast. Watching the morning news, checking your email the minute you get out of bed and listening to talk radio during your commute can all exhaust your mental energy before you even get to work. Instead, listen to music or a motivational audio. You can also expand on #2 above: Go over your life goals and how your actions today are going to take you another step closer to achieving them. These 4 morning habits should get you stoked — body and mind — with energy to succeed on the job … with plenty left over for fun on your own time. Give them a try, and let us know how they work for you!